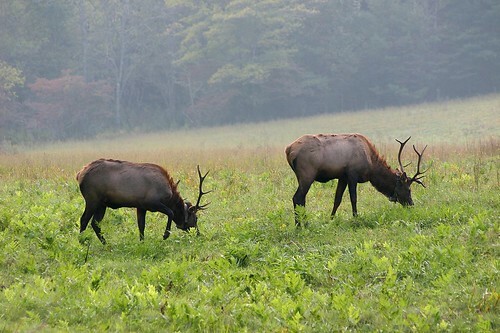 Last spring, Rachelle, her parents and I spent an afternoon at Cataloochee in Great Smoky Mountains National Park in search of elk. 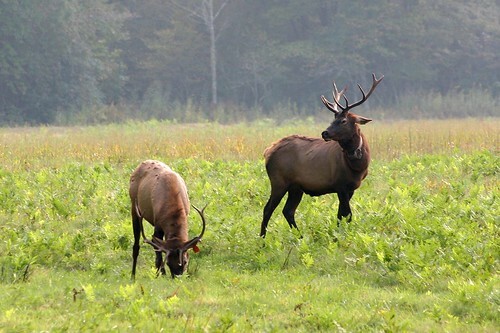 In 2001 and 2002, two separate herds of elk were relocated from Land Between the Lakes National Recreation Area to Cataloochee in the western/North Carolina portion of Great Smoky Mountains National Park. 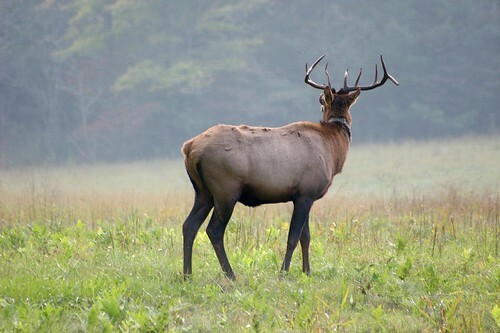 Cataloochee is a relatively isolated portion of the national park, similar to the much more frequently visited Cades Cove in the eastern/Tennessee portion of the park. 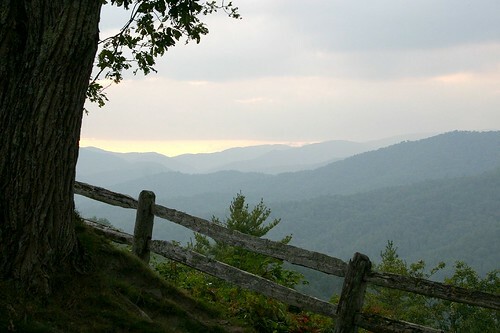 The name Cataloochee is a corruption of the Cherokee name for the area, “Gadalutsi,” which means “standing up in a row,” and could refer either to the mountains which surround the valley, or the abundant trees which cover them. 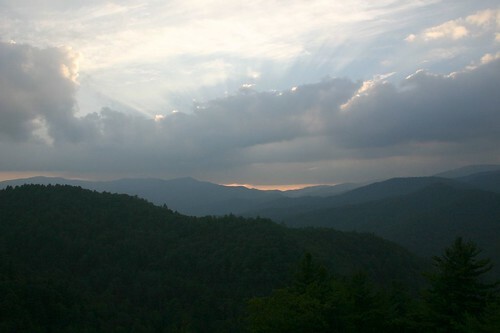 Cataloochee was comprised of two separate communities, Big Cataloochee and Little Cataloochee. 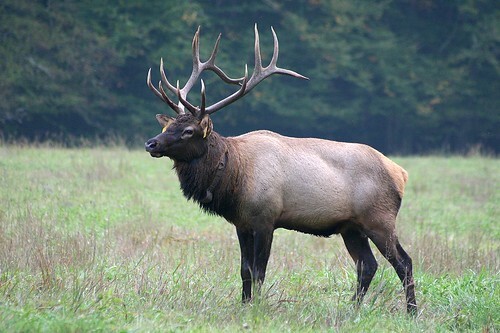 After our previous trip, I wanted to head back in the fall during the rut (mating season) in the hopes of hearing the elk bugle. So, my wife and I planned an October trip to the mountains. 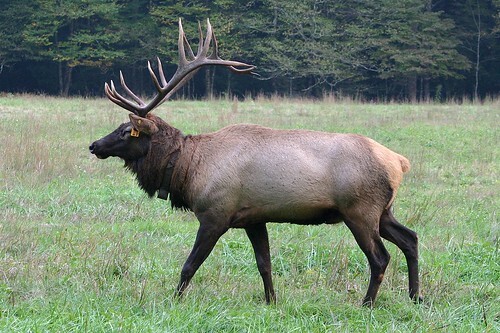 Like our previous visit, we spent our time in Big Cataloochee. We picked a spot on the side of the road, unpacked our stuff and waited for the show to begin. As the sun began to fade, our vigilance was rewarded. We spotted a group of five elk come out of the protection of the trees into the field near us. The group was composed of three bulls (male) and two cows (female). The male elk in the photograph above was very agressive and chased the other two bulls away from his harem. 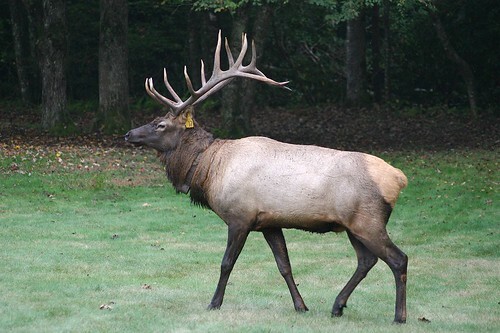 This is the same elk grazing in peace after he had runoff the interlopers. These are the two cows he was “protecting”. The other two male elk were chased off in the direction of the road, and remained close to it – I suppose out of fear of angering their rival. I walked down the road so I could get a closer look at them. Quite a few people were taking photos of this pair. And while everybody kept a respectful distance, the two elk didn’t seem to mind the attention. At least they weren’t lonely! I wonder if he was checking to see if his rival was still around. He and his pair of females were still nearby. 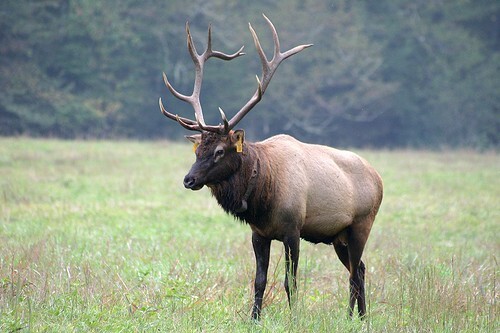 We had also hoped to hear the elk bugle, and we weren’t disappointed in that department. We heard several elk bugle in the distance. Since dusk was quickly approaching we decided it was time to leave. As we were heading down the road toward the park entrance, we saw a large bull in the woods to the right of the road. I got out of the car and on foot followed his progress through the woods. Eventually, I was rewarded with an amazing view of this magnificent creature. This male popped out of the woods and then wandered back in to them – he was probably spooked by all then people attempting to take his photograph. Suddenly, he walked calmly out of the trees again, right in front of me. Then, he paused under a tree to graze for a moment. By this time I had gotten back in our car. As we were passing him, he decided to go for a stroll, so we followed him for a bit, and stopped on the side of the road when he stopped. While we were watching him he let loose with a loud bugle. What a treat! Several other males were also in the area. We watched them for a while, and then resumed our plans to leave the park. On our way out of the park we made one last stop to watch the sunset. Daylight fades from the valley. Rays of sunshine poke through the clouds. 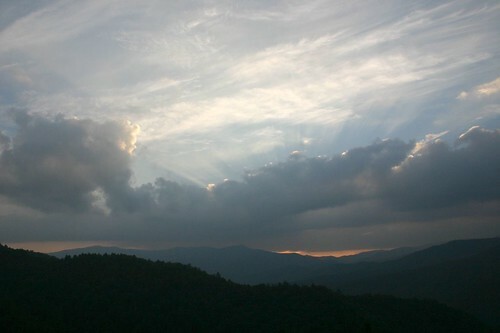 The sun sets over Cataloochee Valley. I have always wondered what the little pocket was for – Now I know! Arthur Chrenkoff signs off with his last post. Thanks for all you’ve done, Arthur. I’ll miss your voice in the blogosphere. But the work he started by reporting “Good News” from Iraq and Afghanistan will continue. Lorie Byrd has a post “in honor of those who lost their lives that day, and to those who live on and through their actions have vowed ’Never Again’”. I took this photo a couple of months before the attacks. Over the past couple days, I have had a knot in my stomach that has tightened every time I have watched television coverage of the devastation, read a news article or seen pictures of New Orleans and the Gulf Coast. I haven’t been able to write about this terrible tragedy, because the scenes of destruction, the stories of lives lost and ruined have been overwhelming. It has hit too close to home for me. My heart is broken for them, not just because of the horrible conditions in Louisiana and the Mississippi Gulf. The devastation December’s tsunami left behind was tragic, but I didn’t feel this way. And hurricanes hit Southern Florida, where my family still lives, and the Gulf Coast last year–but I didn’t feel this way. No, I am so troubled by this tragedy because I have lived through similar circumstances. In the past few days I have been reminded all too often of the horrible days, weeks and months after Hurricane Andrew ripped through my parent’s home and turned our lives upside-down and everything just seemed wrong. All I wanted then was for life to return to something close to normal. Today, there a multitude of Americans who find themselves in that terrible situation. Their lives have been turned upside-down and inside-out. And life won’t be normal for them for weeks and months, if not years. I wish I had the words to describe how much the generosity of strangers helped my family and I cope with our ordeal. Days after Andrew one of my parent’s co-workers gave us a propane stove so we could cook. Many, many others donated the supplies that they had put away before the storm. My father’s employer gave us a jug of water from their water cooler, so that we would have drinking water. Our local Coca-Cola bottler gave away bottles of water to all comers. Many others gave generously and it made life better. My cousin’s house was destroyed; a friend of his gave he and his family the use of a condo. I heard all kinds of stories of people opening their homes and their lives to help. I wish I had the words to say how much that meant. But I don’t, so what I will say is this: Give! Give now, give later, and keep giving. Give until it hurts. If you did without eating lunch out next week and took peanut butter sandwiches to work, how much money would that be? Then give it away. If you go out for pizza once a week, then skip it for a while and give that money away. Even if you ate only rice and beans or tuna fish sandwiches next week, you would still be eating better than many of people along the coast next week. Give away the difference. Turn you air conditioning up, or turn it off altogether and open your windows. You’ll still be better off than many of people in Louisiana and Mississippi. Give away what you save. Carpool and give away the extra. Yes, it is inconvenient and yes gas prices are rising, but it’s still a lot less inconvenient than having your car and home swept away, and at least you still have a gas station to buy gas from. If you are an employer looking to hire, consider hiring someone who has been forced to leave their home–even if only for a short term–to help them press pause on the chaos and uncertainty of their lives. Consider opening your home to people who have been displaced. If you are looking to take someone in Bill Hennessy’s Homes for Katrina Victims, Katrina Home Sharing Registry or Operation: Share Your Home are great places to start looking. Even if you can’t take people in long term, even a warm meal, air conditioning and a hot shower will make a difference. After Andrew a friend of my father’s invited us over for a meal and a hot shower. That afternoon was blissful, even though I knew it would end all too soon. Somehow that shower seemed to transform me; here was something normal–the way life was supposed to be–I felt human again. Looking for other ways to help? Try the KatrinaHelp Wiki, where you can offer your help and find information on ways to help and immediate needs. Lastly, I would suggest giving to Samaritan’s Purse, The Salvation Army or the American Red Cross. The Red Cross website seems to be slow as I post this, so if you live in the Knoxville Area, you can also give donations to the Knoxville Area Chapter, specifying your donation to be used for the National Disaster Response Fund. Glenn Reynolds also has a list of other relief organizations. N.Z. Bear also has a list up of relief agencies. I have joined the list of bloggers participating in Hurricane Katrina: Blog for Relief Day. You can find more bloggers and the charities they are supporting at N.Z. Bear’s special relief page. Please pick one, and donate now. I hope this hasn’t been too maudlin, but I find that I can’t help it. I have been on the verge of tears for days now. Everytime I hear news about New Orleans or the Gulf Coast, I find myself fighting back tears. Katrina blew through my parent’s neighborhood thirteen years and one day after Andrew. And I can’t adequately express how grateful I was Friday morning when my mother called to tell me that they were fine. Our conversation turned to Andrew and that dreadful time afterwards, and I was happy that they were spared this time. But the Gulf Coast wasn’t spared and their lives will never be the same. Katrina will stay with them for years just as Andrew stayed with us. If you are in the Knoxville area, here are some opportunities to donate to the Red Cross over the weekend. Finally, Monday, Sept. 5, the football team will hold the second annual “OrangeAid.” Players will be giving autographs in return for a donation to the American Red Cross at both West Town Mall and Knoxville Center Mall from 6-7 p.m. T-shirts with the inscription “One Heartbeat” will also be available for $15 with the proceeds will go to the Red Cross’ relief efforts. Hats off to my colleagues in the University’s Public Relations Department for promoting these opportunities. UPDATE: I should mention that these opportunities will be for cash donations only. Do not bring items such as bottled water, food or clothing. The collection volunteers will not be prepared to handle those items. As this FEMA press release (via Glenn Reynolds) indicates, right now cash will be the biggest help to those who are affected. Donate to a relief agency and let the agency disperse the funds. I am recommending Samaritan’s Purse, The Salvation Army or the American Red Cross. If the Red Cross website is slow then make a donation to your local chapter. Donations to the Knoxville Area Chapter can be made online. Glenn Reynolds and N.Z. Bear both have posted lists of other relief organizations. The University of Tennessee System has agreed to take in students from schools in the areas affected by Katrina. The Knoxville campus has committed to accept all graduate students, up to 500 undergraduate students, and a total of 50 law students â€“ 20 first-year law students and 30 students from other years. Because of the recent record freshman class size, there is a housing shortage, but university officials will seek accommodations. In Chattanooga, the university will accept up to 100 undergraduates. In Martin, the university will accept 50 students, and has available housing for 25 students. “We fully support the governor’s efforts, and our campuses are enthusiastically responding in various ways to assist in this time of national need,” President John Petersen said. Josh Britton also lists some other schools taking in students: Georgia Tech, U of Tennessee, Rice, Arizona State, U of Arkansas, ULL, Centenary, McNeese St., Louisiana College, UL Monroe, LA Tech, Spring Hill, Arkansas State, Ole Miss, Mississippi College, Texas Christian, Baylor. Vanderbilt, UC Berkeley, U of Georgia are working out details to admit students. Wow! Way to go! I am proud to be a Volunteer. UPDATE: The other UT–Texas, that is–will also be admitting students.